God leans into us so that we will let go of the image of God as unreasonable parent, exacting teacher, or ruthless coach. God is not who we think God is. 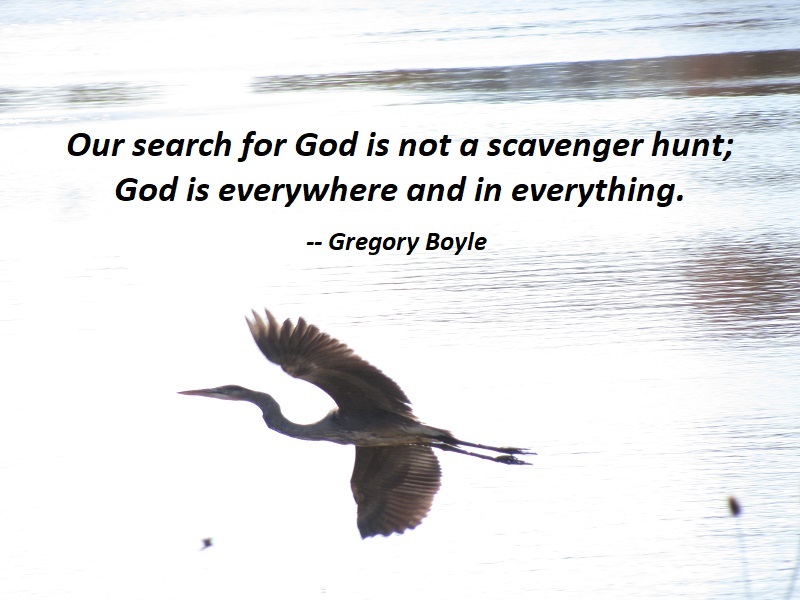 Our search for God is not a scavenger hunt; God is everywhere and in everything. Our sense of God always beckons us to grow, to reimagine something wildly more breathtaking than where our imagination generally takes us. We are nudged toward an increasingly wider view and image of God from our child consciousness to an adult consciousness. God leans into us so that we can find our way to this inner absorption of God. With any luck and some attention, we will keep landing on a better God, finally having grown comfortable in God’s tenderness. This entry was posted on Saturday, November 10th, 2018 at 11:46 pm and is filed under God, Growth. You can follow any responses to this entry through the RSS 2.0 feed. You can leave a response, or trackback from your own site.